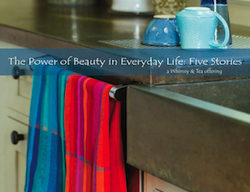 “You must have a lot of patience” is a comment I hear frequently at craft shows where I sell my towels. I’ve grown used to it, but it still makes me pause. I am in fact a patient person, but I rarely think of patience and weaving together. Weaving is a slow process with lots of repetitive steps. For the towels that are on the loom right now, I made a warp of 483 threads. I then threaded each one through two different holes – one that determines the width of the fabric, the other that affects the pattern. To weave each towel I throw the shuttle back and forth about 670 times, assuming I don’t have to unweave any of it. I may have found these steps tedious when I first learned to weave, but over time they have become second nature. I’ve developed habits that make me more efficient and alert me when something is not quite right. Now I am calm and focused and love the days when I get to weave to my heart’s delight. For me, activities that do require patience include waiting my turn at the DMV, sitting in a traffic jam, and being put on hold by AT&T. These activities share the element of waiting for an unknown period of time. They are also activities that, given the choice, I’d rather not do. I have learned that getting irritated won’t make the line move any faster, so I take a book or knitting with me to the DMV and switch the phone to speaker mode so I can do something else until the next AT&T representative is available. The word patience – like passion – comes from the Latin verb patior ‘to suffer.’ I rarely suffer when I weave. On the contrary I experience a quiet joy. I am doing exactly what I want to do. I am not in a hurry to finish so I can go do something else. Once the warp is on the loom, I sink into the relaxing rhythm of weaving and watch the pattern emerge and the cloth grow. In fact I purposefully choose patterns that allow me to drop into these meditative rhythms. Sometimes I listen to music while I weave, but only as ambiance and never with the intent to actively listen. I do not watch a movie or talk with friends. My attention is on the rhythms – treadling, throwing and catching the shuttle, and beating the weft into place. My breathing synchronizes with these motions, my thoughts drift and any charged emotions dissipate. Do I weave because I’m a patient person or am I a patient person because I weave? I don’t know and I don’t know that it matters. I weave because it brings me joy, keeps me centered and adds beauty to my everyday life. I probably have grown more patient since I started weaving. More importantly though, I believe weaving has taught me about mindfulness. I’ve learned the value of bringing my full attention and presence to whatever I’m doing, be it weaving or waiting at the DMV. My invitation to you: To what activities do you bring your full attention and presence? How does being fully present affect your experience? I’d love to hear about it. Marilyn this is an excellent article! 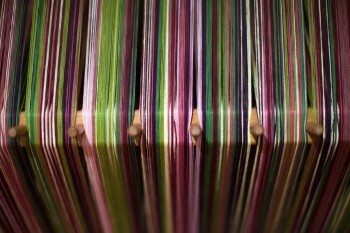 Weaving is an art form I’ve always loved and never pursued so I appreciate how you explained your process. And the Caribbean towel is stunning! I was once told that Caribbean blue is my most inspiring color for writing! I’m enjoying following your process in MYM–love to see an artiste’ getting out there and sharing her gifts and talents!